The P-38 Lightning was a potent, temperamental aircraft, so the guys who took the controls had to be a skillful bunch. They had to master counter-rotating props, manage thirsty engines, maximize an awesome array of firepower and perfect their air-to-air tactics in an ever-changing air war. The P-38H in the foreground was flown by Tommy McGuire, one of America's most distinguished aviators, Medal of Honor recipient and second leading ace of all time. In the air war over Europe, German pilots referred to the twin-boomed Lightning as the "fork-tailed devil. 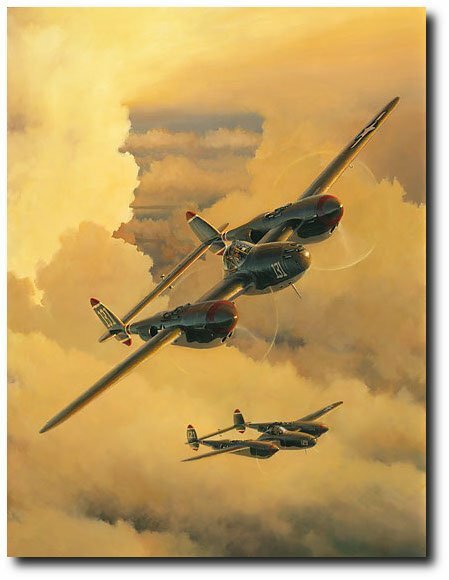 In the Pacific theatre, the P-38 was credited with more aerial victories than any other American fighter.